ESL Interview with Adon Lee! See that guy above? That is Adon Lee and he is going to talk to you today about himself and the company that he works for. So, get your coffee or favorite beverage and get comfortable. Today's interview is a real treat for pronunciation fanatics. 1) First of all, could you tell us a little more about yourself and your role at English Computerized Learning (ECL)? Adon Lee: I was born in Edmonton, Alberta, Canada where I studied Asia Pacific Management at Grant MacEwan University and currently live in China. I am VP of Product Development as well as the Asia Sales Manager due to my presence in Asia over the last 6 years. I began my work with ECL in 2005 as the Asia sales manager, after completing a four month work experience in Mainland China. ECL, while actively expanding into other Asian markets, had still not broken into the Chinese market and required a presence to ensure the proper development of those markets. I currently manage distributors in Asia as well as working with software developers in Canada and Asia on new developments and technology implementations. 2) I read that Debbie Lee is the president of the company and your last name is also Lee. Is there any relation? With this in mind, is ECL a family owned business? I'd love to learn more about the people behind ECL and how the company has grown since 1995? 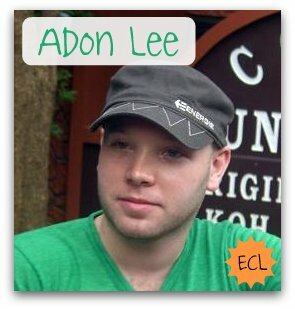 Adon Lee: Well, ECL was founded by siblings Debbie and Terry Lee. The company is mainly a family owned business with the majority of our shareholders having family ties to the Lee family. Debbie Lee is my mother and Terry Lee is my uncle. Terry Lee was president from 1995 until his retirement in 2006, at which time Debbie Lee became president. Debbie Lee attained a Bachelor of Education degree from the University of Alberta (1976). Her studies focused on Special Education, Reading and English as a Second Language. Debbie has over 35 years of ESL experience teaching in several Asian countries such as Singapore, Malaysia and Thailand. Furthermore, Debbie developed ESL curriculum, conducted teacher training workshops for the development of effective teaching techniques, worked as a program coordinator for various organizations -including the Continuing Education Department, Edmonton Catholic Schools- and as a consultant for the English Language Studies Institute in Taipei, Taiwan. With Debbie’s extensive teaching and curriculum development background along with Terry’s business acumen the team set out to develop something that was missing in the ESL software market. ECL was one of the first companies to identify the need for an effective way for ESL learners to improve their spoken English. ECL’s initial CD based productSpeech Solutions was created and quickly became a favorite with education institutions around the world. Since then ECL has grown to include 6 different products delivered by download, CD, online and mobile. The highlight of ECL’s product line is the award winning "Pronunciation Power" line. Pronunciation Power is now used and recommended by thousands of schools, corporations and governments around the world and has helped millions improve their spoken English. Most recently ECL has launched a new online program called eEnglish by Pronunciation Power. 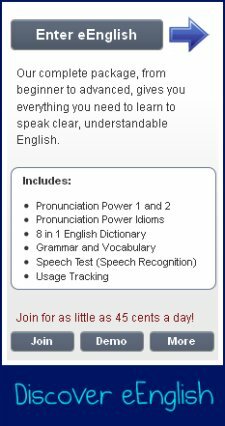 eEnglish incorporates all of ECL’s products, delivered online, as well as two great new features; the Pronunciation Power Speech Test and usage tracking. The Speech test incorporates HTML5 and pronunciation analysis to automatically tell the users which sounds they are having problems pronouncing then directs them to the specific lesson they should study to improve that sound. The Speech Test is truly an amazing way for students to identify which of the 52 sounds of English they should improve, guiding them to the steps they should take to improve those sounds. Usage tracking is a great way for students to track which lessons they have been using and also gives teachers information on the usage habits of certain students to help guide them on their use of eEnglish. 3) Now that we know a bit more about the company and the people behind ECL, could you tell me what ECL's motto or ideology is regarding the creation of pronunciation products for ESL learners? Adon Lee: ECL identified that the most difficult part in both learning and teaching English is the pronunciation of the language. Many teachers in foreign countries pass on their accent to their student creating a cycle of poor pronunciation. ECL looks at offering a tool to help not only with pronunciation but also with listening comprehension, spelling, vocabulary, reading and most importantly giving the student confidence in their ability to speak clear and understandable English. 4) With over 15 years in the industry, I am sure you have seen some patterns when it comes to students who fail to improve. Could you tell us what these students (and even teachers/academies) are doing wrong? What common assumptions or actions work against the progress of students? Adon Lee: Teaching English pronunciation can often be a controversial topic. There are many people, including some ESL teachers, who believe that a person’s accent is part of their “identity” and should not be improved to sound like a native speaker. While we respect individuality we believe that to become a truly effective communicator it is important to have a certain level of speaking ability. ECL’s products do not only focus on the specific sounds of English but also incorporate lessons on stress, timing, articulation, intonation and rhythm; what we call S.T.A.I.R. All these subjects are very important to focus on if you would like to be understood while speaking English. Two of the biggest things teachers, academies and students are doing wrong are not focusing on pronunciation during study time and not integrating spoken English into their examinations. I have met hundreds of students, mainly in mainland China, who have a very high level of grammar and vocabulary but simply do not feel confident when speaking. It does not help that many universities focus on grammar, reading and vocabulary for their entrance examinations. This leads to many private English schools also not focusing on teaching pronunciation. We strive to change the trend and show both schools and individuals how important it is to focus on spoken English by creating fun and effective lessons and exercises and incorporating state of the art technology to test the users spoken English. 5) How are your Pronunciation programs different (better) from the rest on the market? What sets your programs apart other products? Adon Lee: We focus on many aspects when we create our products. Most importantly is the quality of content. ECL was the first company to incorporate side and front view animations to show users exactly how to move your mouth to pronounce a certain sound. Our lessons and exercises then progress in an effective way going on to sample words, comparative words, and slowly building up complexity as the user becomes more confident in both speaking and recognizing the sound they are studying. We always keep our delivery methods up to date with current technologies which can be seen by our development of mobile learning applications, HTML5 integration and state of the art pronunciation analysis. Outside of the programs themselves we also pride ourselves in offering great customer service. Questions will always be answered in a timely and effective manner. Another big thing we like to focus on is staying affordable. We were all students at one time and understand the cost of Education. We offer affordable solutions such as eEnglish for less than 44 cents per day to try to allow everyone the chance to experience our amazing products. 6) How can a student ensure that they improve their pronunciation with these resources? What kind of study guide, commitment and attitude should students have in order to get the most from your products? Adon Lee: With eEnglish we have created a great way for users to measure their success with Pronunciation Power. We recommend that each user begins the program by taking the Speech Test to identify which sounds they should focus on and to get a general score for their spoken English ability. Once the user has studied with the program for a period of time they can once again take the Speech Test to see how their pronunciation has improved. Sections under the user’s personal account will visually show improvement by graphing their progress in an easy to understand manner. If a student is committed to improving their pronunciation we have seen that they can start to see progress within weeks of using our programs. As with learning anything the students must be committed and understand "practice makes perfect". We supply all the tools needed to improve the student’s pronunciation and we make the programs fun and user friendly but it is their self commitment which will ultimately ensure their improvement. 7) On May 3rd 2010, ECL launched it's latest and greatest online resource, eEnglish. Could you tells us what eEnglish does for English learners and who it was designed for? Adon Lee: We are extremely happy with the launch of eEnglish and have received great feedback from schools around the world. Within weeks of launch we have already had schools making eEnglish an essential purchase for many of their courses. eEnglish incorporates all of our products from beginner to advanced, giving students everything they need to speak clear, understandable English. eEnglish is designed to be used in any environment from the classroom to the home or in the office. We have also added many great tools that schools and corporations can use to meet their English training goals such as custom modules designed to easily incorporate specific vocabulary, sentences and dialogues, plus teacher accounts to see the student’s usage and test results. 8) What kind of feedback have you received about eEnglish from students so far? Adon Lee: Students have been amazed by eEnglish so far. While they have always loved the core Pronunciation Power products they love the new features and especially the Speech Test. We teamed up with many students to test eEnglish during its development phase. Another key recommendation we implemented was for the user to be able to leave the Speech Test before completion and then have it automatically save the users progress so that they can continue it at another time. We are always listening to student and teacher feedback and try to incorporate all their great ideas! Thank you very much for taking the time to speak with me today Adon Lee. Click here for more great interviews like this one with Adon Lee.